Hey Look, it's my 500th post! Yipee! year of this silliness in March!?? This is a long way around making an itty bitty little point way at the end, so bear with me on this post. Now, I love math. Well, I guess I don’t actually ‘love’ math, but it seems that I have a brain that feels comfortable when dealing with math. 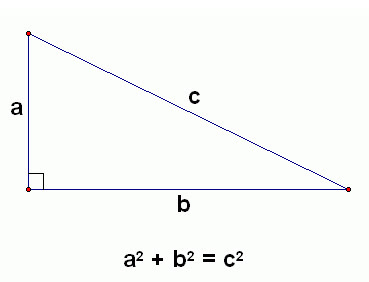 Simply put, if the angle where a and b intersect is a right angle, (a 90° angle) then the Pythagorean Theorem works wonderfully. Say the distance for side ‘a’ is 3 inches and the distance for side ‘b’ is 4 inches, then by doing the math (3²+4²=c² and 9+16=c² and 25=c² and 5=c) you see that side c must equal 5 inches. In my noodle, at least, this is a no brainer. Another great equality is Newton’s third law; For every action, there is an equal and opposite reaction. I'd like to extrapolate Newton's law one more step; For every sin committed, there must be an equal and opposite payment made, to pay for that sin. That seems reasonable and fair to me. Perfect justice demands that the robber get exactly what he deserves. No more, no less. It can be difficult to decide what the robber deserves as punishment, but with perfect justice, as with the equal sign, the punishment is matched exactly with the crime. But, in an equitable society mercy should also be shown. But, if mercy is granted to the robber, then justice can’t be served. (the second man is robbed of money, and therefore justice) So how can we show mercy, without justice being denied? If there were a mediator, say a third man in our example, who would show mercy and pay the robbers debt, and then require some sort of payment from the robber, then both justice and mercy can be served. WASHINGTON (Reuters) - President George W. Bush will unveil a plan on Thursday aimed at slowing a wave of home loan foreclosures that has threatened to knock the U.S. economy into recession and rattled investors worldwide. The plan hammered out by the U.S. Treasury Department in talks with mortgage industry leaders would bring relief to many of the 2 million homeowners who took out adjustable rate loans with payments due to move sharply higher in the next year or so by offering some of them a five-year mortgage-rate freeze. If we try to put an equal sign in to this news story, it isn't equal or fair. On the one side of the equal sign, Bush is trying to show mercy by freezing adjustable rates for 5 years. This will save homeowners money while they try to get themselves into a different mortgage or sell their homes for what they can. It could also save the economy from sliding further. I'd say that's some pretty hefty stuff on the one side. But, no one is looking at what's on the other side of the equation. Who is going to pay for this? Banks, investment companies, and investors will all lose money. A lot of money. Including individual investors and retirees who have IRA accounts with these companies. Some may argue, “They are big business, they should be knocked down a peg or two.” Or, “They made a bad investment choice, too bad so sad”. I don't agree. If this plan is put in place, it is yet another example of government trying to redisturbe wealth, or tax the rich, or dirty on the those who have... In my humble opinion, Bush is showing too much mercy, and forgetting justice. When in any society, mercy is given too much and too often, [a robber is shown mercy and the victim receives no justice], that society becomes inefficient, corrupt, citizens become angry and tired of injustices, and the society is ripe for revolution. Now, how about a little fun? Bryan Berg, the acknowledged inventor of cardstacking on the grand scale, embarked on a month-long project with The Texas State Fair in Dallas, TX to create a new Guinness World Record for the World's Tallest House of Playing Cards. A self-taught artist, Berg uses no tape, glue, or other tricks in his work. With 1,800 decks of freestanding playing cards, some scaffolding, and a hole in the ceiling, he worked for five weeks to complete the 25 foot, 9.5 inch tower- limited only by the height of the building he was working in and time. Even the artist was surprised at how strong his huge construction turned out to be, when a leaf blower shorted out during the knockdown and he was forced to take a "Godzilla" approach and destroy the tower by hand. This is the third time Berg has been commissioned to break his own world record, the first of which he set in 1992 at the age of 17. Check out the links below to see press coverage of this and other recent works. Here's the world's record video. 10/19 - Can I go too?